ADFA North Zone invites you to experience a variety of plays, including one written by a local playwright! The plays will be publicly adjudicated by a professional theatre artist and awards for Outstanding Performance, Director, Technical Achievement, and Production will be given out at the end of the festival. In this diverse line-up, there is something for everyone! Some plays may contain adult subject matter and language. • What Time Does the 3 O'Clock Parade Start? Email Alberta Drama Festival Association (ADFA) representative Hanna Fridhed at hanna.fridhed@adfa.ca or visit https://adfa.ca for more information. About ADFA: The Alberta Drama Festival Association is a non-profit umbrella organization for adult community drama activity in the province of Alberta since 1967. Ten different regions of the province each organize an annual Regional One Act Theatre Festival where local theatre artists are given the opportunity to independently produce and showcase their work. From these festivals, one production is chosen by an adjudicator to represent each region at the annual Provincial One Act Theatre Festival. 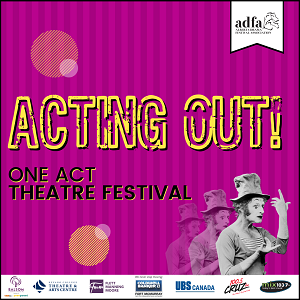 On Saturday, April 13, 2019, the ADFA North Zone will host the Wood Buffalo festival: Acting Out! A number of locally produced one-act plays will perform on the Keyano Recital Theatre stage, adding color and theatrical innovation to Wood Buffalo.